ABOUT "BURIAL CHAMBER HAUNTED COMPLEX"
Rated a top 13 screampark in the US by Hauntworld, Burial Chamber hosts four full-sized professional attractions at one location, featuring over 125 actors nightly, two indoor haunted houses (Adrenaline and Insanity), one outdoor haunted woods (Phobia), and four Burial Simulators. Our professional haunted attractions feature Hollywood-style sets and sounds, top-notch acting and haunted entertainment. Burial Chamber continues to be voted #1 by it's Visitors last year. Customer satisfaction is a priority. Fastpass Timed Ticketing will be available again this year at Burial Chamber. Why wait in long lines for the haunted houses when you can purchase a Fastpass Timed Ticket from our website and go directly to the VIP lines at your specified time? Skip the wait! Please go to our website for more information on our haunted house events. 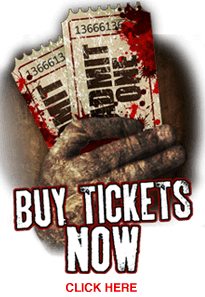 Wisconsin Haunted House SPECIAL EVENTS for Burial Chamber Haunted House: Spend the night packages, Fastpass skip the wait packages, Fastpass Timed Ticketing, special event nights. Check the website regularly for details, updates and special events. Blackout Nights:  November 4-5  Come back on the November 4th and 5th to see Adrenaline pitch-black! You and your group go through with only an LED candle! - Friday and Saturday: 7pm - 11:30pm; Sunday & Weekdays: 7pm - 10pm (Ticket booth opens at 6:45)  Haunted Houses close when lines end. By far one of the greatest haunted houses Ive been to. You can tell the amount of effort that goes into the making of these houses and the actors are outstanding. Im definitely going more than once this year. We had a great time going through all three of their Haunted houses. It was awesome to see my wife jump and scream as the creatures came at us from all different angles! I can definitely see why it's rated one of top places. We'll definitely be back. Thought the first house was really scary but after that just thought the other two were really cool! Loved the new additions! Loved all the extra little houses in the woods of Phobia & the new spinning module with the bridge you had to cross! Actors were great & they seemed to have just as good a time! You definitely get your money's worth out of the 3 houses! I come back every year! It never disappoints!